The Eyrarland Statue is a small bronze seated figure, which is widely understood to represent Thor with his hammer. The original was found at Eyrarland near Akureyri and dates from the year 1000. It is housed in the National Museum of Iceland. 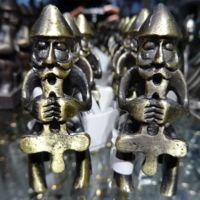 These replicas are popular souvenirs in Iceland.